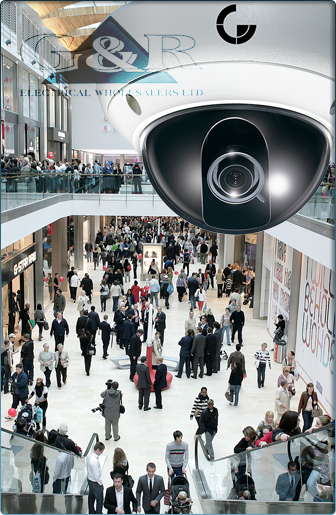 Here at G&R Electrical Wholesalers, we’re one of the largest suppliers of CCTV cameras in the South West, being an official Authorised Distributor of Hikvision CCTV. With a new dedicated warehouse holding over 300 cameras, we’re proud to offer our customers live samples of most cameras, so please feel free to pop in and take a look at our huge range. Whether you’re looking for analogue, HD-TVI or full HD IP CCTV systems, we’re able to work with you on any size project to ensure the highest standard of design and finish. With local specialist security installers on hand to fit any CCTV system you choose, your security needs are covered thanks to G&R Electrical Wholesalers – so contact us now for more information. Security is often one of our primary concerns, be it at home, in the office or in an industrial setting. Thankfully, G&R Electrical are well known for helping to install the highest quality CCTV Plymouth, Redruth and much of Devon and Cornwall has come to demand. Combined with our experience in alarm systems and large security projects, our CCTV division is here to work closely with you to deliver outstanding projects to deadline, within your budget. With years of experience to call on, you can rest easy in the knowledge that the CCTV Plymouth needs to ensure a high level of security in its homes and businesses is only a phone call away here at G&R Electrical. With specialist engineers, installers and products on hand to make sure every part of your project runs smoothly, there’s nowhere better to go if you need video surveillance on a budget in the South West region. On top of our brilliant installation and electrical wholesaler services, G&R Electrical are committed to the highest level of customer care that CCTV Plymouth, Redruth and South West customers have come to expect from us. With our excellent inventory, stocked full of CCTV essentials, combined with our knowledge gained from years working closely with small local contractors and large national businesses, we’re sure you’ll be able to find exactly what you’re looking for at G&R – and we won’t make a fuss about going out of our way to help you whenever you need it. With our specialist teams based across our two branches in Plymouth, Devon and Redruth, Cornwall, we’re able to offer products, advice and services across the South West region, something which we’ve been proud to do since the conception of our CCTV Plymouth branch. Finding a trustworthy and reliable wholesaler for your electrical projects can sometimes be a chore, but combined with our bargain prices we’re sure our customer service will leave you glad you chose G&R Electrical. Feel free to reach out to us for any electrical installation, as we’re confident we can provide you with exactly what you need – be it advice, products or specific services. Simply contact us now by telephone for a quick chat with a sales consultant, or pop in to our CCTV Plymouth or Redruth branches where you’ll be able to meet with one of our friendly advisors face-to-face.